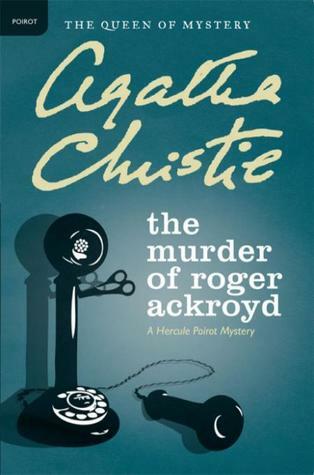 One of my reading goals for the year was to read another mystery by Agatha Christie. Of course I saved this goal for October because, as I noted in the most recent episode of the Book Blab, autumn is the absolute best season in which to indulge in a good mystery. I knew I wanted to read something by Agatha Christie because the two mysteries of hers I'd read previously (And Then There Were None and Murder on the Orient Express) were impressively executed while being extremely engaging. In other words, I was pretty sure going with another Agatha Christie was a safe bet I wouldn't come away feeling disappointed. But still, which one to choose? Faced with an overwhelming number of possibilities, I did the only sensible thing and sought a recommendation from an expert in the field: my cousin, Erin, who has read every single mystery written by Agatha Christie. I asked for three of her favorites, and she gave me: The Murder of Roger Ackroyd, Sleeping Murder, and Endless Night, with two runners-up, A Murder is Announced and After the Funeral. Seriously, if you don't have an Agatha Christie guru in your life, I feel sorry for you. Out of that now-manageable list, I went with The Murder of Roger Ackroyd because Erin had lavished it with especially high praise and because it cast Hercule Poirot as the detective. The mystery is narrated by James Sheppard, a country doctor living in the village of King's Abbot. When Mrs. Ferrars is found dead in her home, he is called in to determine the cause--an apparent suicide. Later that same day, his friend, Roger Ackroyd, insists on speaking with him. In the last year, following the death of her husband, Mrs. Ferrars had become quite close to Mr. Ackroyd. In fact, everyone in King's Abbot was sure they'd waste no time getting married after her period of mourning. So of course Dr. Sheppard is not surprised at Mr. Ackroyd's emotional distress. However, it's more than just sadness at her passing. In the privacy of his study, Roger Ackroyd confesses what Mrs. Ferrars had earlier confessed to him: she had poisoned her first husband after enduring awful abuse as his hands for many years. Besides keeping the secret, which has haunted her for the last year, Mrs. Ferrars admitted that one other person knew about her misdeed and had blackmailed her into giving large amounts of money in order to not be exposed. Although Mr. Ackroyd demands to know the identity of this individual, Mrs. Ferrars holds her tongue, saying that she'll tell him in twenty-four hours. Now of course, she's dead, which seemed to be her plan all along. Mr. Ackroyd doesn't know what to do. Just as this conversation is going on, the butler comes in with the evening post. And there, in her own handwriting, is a letter from Mrs. Ferrars. Mr. Ackroyd knows that it must contain the name of her blackmailer, and he tells Dr. Sheppard that he will fill him in on it after he has read it in private. So Dr. Sheppard returns home, only to receive an anonymous phone call a couple of hours later saying that Roger Ackroyd is dead. It's obvious that Mr. Ackroyd's murderer must be the same person as Mrs. Ferrars' blackmailer. It's just too much of a coincidence otherwise that he would be holding the implicating letter in his hands that very night, right? Or maybe not. Because, as it goes with mysteries, as soon as one person's secret is out, it seems to have a domino effect on everyone else's secrets, and, it turns out, everyone (the butler, housekeeper, maid, stepson, sister-in-law, niece, secretary, friend) has a secret, whether it's actually connected with the murder or not. This novel reminded me why I love mysteries and also why I don't read them very often. I finished listening to it right before bed one night, which was probably the worst idea ever. Not only was my head spinning after the grand reveal (which made me insist that Mike read it as soon as possible so I'd have someone to discuss it with), but I was also just a bit terrified. There's something about becoming so invested in another person's death, albeit fictional, that just leaves you feeling a bit off. But I can't deny that I was super interested the entire time and felt this heightened sense of observation and suspicion that gave me something of a reader's high. It was pretty thrilling to watch it all unfold, and I think it would be equally thrilling to go back and reread the whole thing knowing now how it ends. I'd love to hear your take on mysteries. Do you like them? And, if so, tell me some of your favorites! I do really like mysteries! I prefer cozy mysteries like Agatha Christie's to any of the ones where you get inside the mind of the killer. Yuck. No thanks. Another classic mystery writer I enjoy is Georgette Heyer. Her characters and dialogue are so well done--they mystery seems a bonus. A modern series I've found that I really like are the Meg Langslow mysteries, by Donna Andrews. They just make me laugh--which seems odd to say in regards to a murder mystery--and the mysteries are good too. I've read several Christie mysteries including this one but none of the others your cousin suggested. I'm going to look into them. I'd like to try one of her standalone mysteries which several of those look to be. I really think you might like the Flavia de Luce series (can't remember if you've tried these?). I think she might be my favorite character in all of literature.